This six-lesson series gives children a "big picture" look at what God was doing through Moses and how that fits into the greater redemption story. Lessons cover Moses' birth through the giving of the Ten Commandments. Disc 1: Overviews, skit, counseling and complete Bible lesson demonstrations. Disc 2: Full demonstrations of songs suggested in the series: Children All around the World, Did You Ever Talk to God Above?, God's Way, What's the News?, Isaiah 45:5 (I Am the Lord), 2 Samuel 22:2 (The Lord Is), Matthew 22:37-39 (You Shall Love). 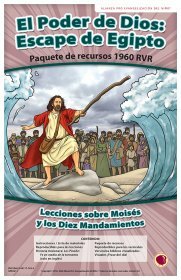 Includes visualized Bible verse booklet, Word-up booklet, Bible time line and map additions, resource booklet, large Wordless Book, lesson and verse reproducibles. All in Spanish.